I've been creating distressed patterns for years, and have found some great ways to build new and interesting distressed graphics just from my surroundings. What makes it even easier is that you can get started with just your camera phone. Grab your camera phone. If you are one of the six people on the planet that doesn't have one, just use a digital camera. The benefit of using digital photography is the immediacy of the image. You can tell right away if the shot you took is what you wanted. Don't like it? Take another. Or twenty. Get what you can use. For our purposes, we are looking for interesting patterns, textures and contrasting elements that can be the basis for creating Photoshop textures that we can apply to graphics. The best are those that have strong light and dark juxtapositions, interesting positive and negative shapes, forms, and even some direction in their patterns. You want to look for something "different." If you are trying to choose the right thing to take a picture, think about how you might use the image or how it might form the foundation for something else. In about five minutes of walking around outside, I found a few textures that I think might make some good candidates. For the sake of simplicity for this article, I'm going to apply the same technique in Photoshop to each of these so you can see how the patterns might differ. 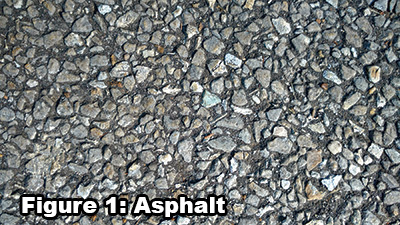 The six photos chosen will be Asphalt, Bush, Carpet, Concrete Aggregate, Grass and Shrub Shadows (see Figures 1-6). These are all taken with my camera phone, and not altered in any way. After I opened each in Photoshop, I resaved them at 300 dpi, at 8-inch x 4.5-inch file size. As you can see, nothing special. You can take these. In fact, you probably can take better shots of more interesting patterns - but I went with the first things I saw. In Photoshop, you can spend a lot of time messing around with each of these to get the perfect balance of dark versus light, edge definition and all sorts of image improvements. I'm not going to do any of that. What we want here is quick and dirty, and ultimately, some unique patterns. For each of these photos, I converted them from RGB mode to Grayscale. While these patterns are already somewhat interesting, they are going to take on an entirely different feel because we want the randomness of nature and found objects to influence our look. The Grayscale mode is important as we'll ultimately be converting each file to a high-contrast file we can use. It will simply be black and white. If you aren't happy with the tones in your Grayscale file, here's your opportunity to change them by applying a quick Curve to them and get it the way you want it. For me, I didn't change anything for these shots. Here's where the fun begins. Another mode change - go from Grayscale to Bitmap. This is going to completely remove all gray tones in your file and make everything either black or white. The trick here is to use the "Method" pulldown in the Bitmap mode command, and each of the selections produces a different type of look for your file. I would suggest trying them all out. For our purposes, though, we only chose two. 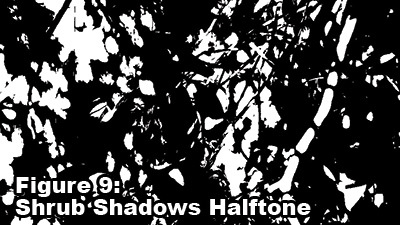 50-Percent Threshold: This removes all of the gray and midtones completely and leaves a black-and-white pattern. There is no ambiguity here. This is the boldest selection, and if you have the right pattern, often the most starkly creative looking in the bunch. 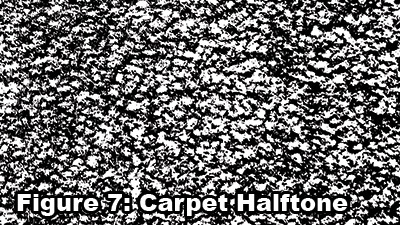 Carpet Halftone was created using this method. 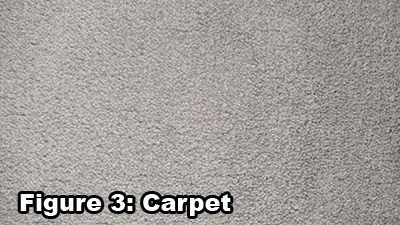 I needed to punch up the texture first so I ran an Unsharp Mask on the file before converting to further delineate the shapes in the carpet (see Figure 7). 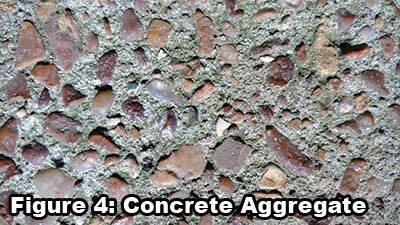 Concrete Aggregate Halftone was created, but this time I just went right from Grayscale to Bitmap, without any file adjustments (see Figure 8). 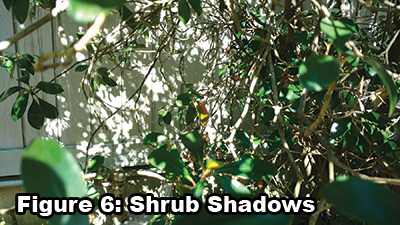 Shrub Shadows Halftone was created the same way as the concrete texture (see Figure 9). 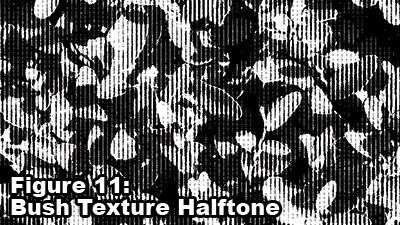 Halftone Screen: This converts your file to a halftone that you can use. 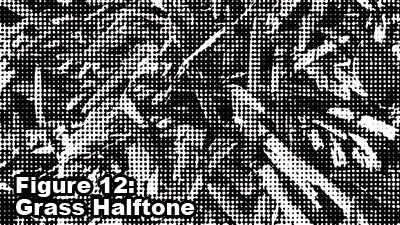 The cool trick here is that you can select different types of halftone shapes, angles and frequency (the amount of the halftone per inch). For my selections I chose to show some different patterns so you can see how they look. 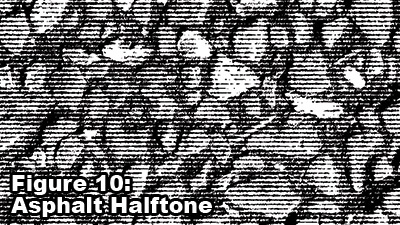 Asphalt Halftone was created using the Bitmap Halftone at 30 lines/inch, 0 angle degrees and with the Line shape (see Figure 10). This produces a great effect that looks like old fashioned scratchboard, or maybe woodcut if the lines are thick enough. The 0 angle makes the lines go horizontal. 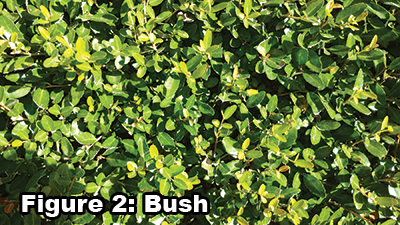 Bush Texture Halftone was created the same way, but the angle was set to 90 instead of 0 (see Figure 11). This makes the lines go vertical instead of horizontal. 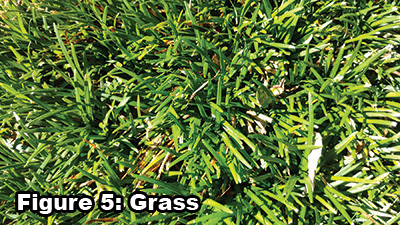 Grass Halftone Texture was created by not using lines, but dots instead (see Figure 12). The number variables where the same. Thirty lines/inch, 0 angle, so the pattern is horizontal. Each of these files took maybe twenty or thirty seconds to process - compare with the original images. These are huge time savers if you are looking to create something unique for a creative piece you are working on. So you are asking yourself, "That's great Marshall, but how do I use these?" For the purpose of demonstration, I created a "Property Of" graphic to test out each of these files and see how it can change the look of the type by clipping it into the file. At the end of the process you could separate this two ways. My graphic is a simple file, nothing fancy. It looks okay already, but once we throw some of our new filters on this, it's going to look even better. For our demonstration I'm just doing this in Photoshop. It's easy. I just copy and paste each of the final textures, and select the dark areas of the graphic. Invert that selection and choose the texture layer. Then click delete. The texture layer is applied to the graphic, and you can choose the opacity of the file until you're happy with the resulting pattern overlay. 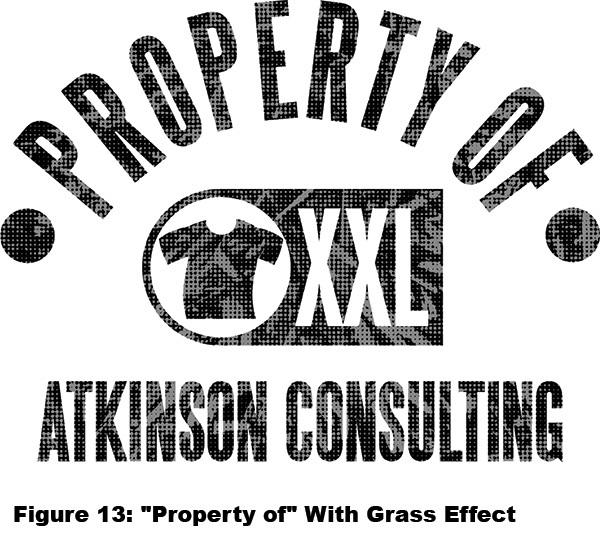 I liked the Grass effect the best for my file (see Figure 13). There are two ways to separate this file for usage. The first is simply to just flatten the file and save it as a .tiff, and bring it into your vector program to print. 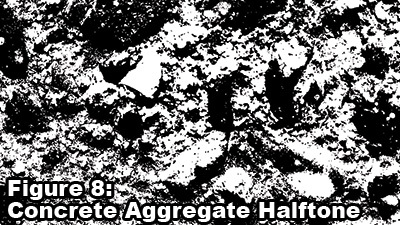 This will make the Grayscale elements of the file print with the correct halftone dots and patterns you normally use. This would print as a one color - all day long. Another method would be to separate this in Photoshop into two colors. One gray, one black. This gives you more control when printing, and you won't be reinterpreting the halftones in the design. I like this control, but it's two colors instead of one, so your production costs will increase going this route. It is a little more work to get this, but in the end, it will be a better print as you have more control of the aesthetic as you can choose the colors you will be printing with in each screen. By the way, these are exactly the same steps used when separating a file for simulated process seps. It's ridiculously easy. First, merge the graphic and the texture layer so that it is just a single layer. Then, while still in Channels, click up and select the RGB channels. You are selecting your art file on the Layers now. At the top menu selections, choose "Select," and then pull down to grab "Color Range." In Color Range, you can select as much or as little of the area you want to grab. This is controlled by the "Fuzziness" slider. For our purposes, we are going to use the eyedropper tool and select the gray area we want to make into a channel. Make sure you have "Invert" checked so the background in this tool will be white. Select the gray area and pull the Fuzziness slider until you are happy with your selection. This grabs everything you want for the channel. This will have the "Marching Ants" show for your selection. Click the create a new channel button at the bottom of the palette. A new channel will be created and it will be automatically named Alpha 1. It will be a solid black square, but the "Marching Ants" will be visible. Just invert the art ("Command "I"), and deselect the "Marching Ants" ("Command D"). This will now show the graphic selection you have chosen on a white background. Check "Spot Color." Double click on the red square, and the Color Picker palette will appear. Choose Color Libraries, and pick the PMS color you would like this spot color to be. Back on the Channel Options palette, make the solidity 95 percent. Review and make sure everything is ok with your files. Then to split the channels to get them into a format you can use, just delete the RGB files and leave the two new channels. Choose "Split Channels" in the channel command section and save each as a .tiff file. Make screens with each and print away! If you want to play with these files and try them yourself, email me at marshall@atkinsontshirt.com. Memphis, Tennessee-based Marshall Atkinson is the owner of Atkinson Consulting, LLC, a shop mentoring firm focused on the decorated apparel industry with process improvement, efficiency, sustainability, employee training, social media marketing, and long-term strategic planning. Atkinson is also an owner at WORK., a B2B online apparel and promotional marketing firm (www.workshirt.net). A frequent trade show and webinar speaker, he publishes his own blog weekly at https://atkinsontshirt.com/. This article appeared in the SGIA Journal Garment Edition, Winter 2017 Issue and is reprinted with permission. Copyright 2017 Specialty Graphic Imaging Association (www.sgia.org). All Rights Reserved.